Information have has it that Apple has a special event scheduled for March 25 and its annual Worldwide Developers Conference set for an official June 3 start, but unless the iPhone SE will be spectacularly brought back from the dead in the form of a notched sequel long believed to have been canceled, we probably need to wait until September for the traditional announcement of a new iOS handset family. This is widely expected to include three models, just like last year’s iPhone XS/XS Max/XR lineup, and there’s a good chance the LCD panel technology of the lower-cost XR will be left behind for good. But perhaps the most exciting upgrade reportedly cooked up by Apple is a move from single and dual camera systems to dual and triple lens solutions. While the company often likes to do its own thing, resisting industry trends and fads, everyone from Samsung to Huawei, Sony, LG, and Nokia seems to think more imaging sensors is better, leaving little choice for Apple but to try to compete in the multi-camera segment. 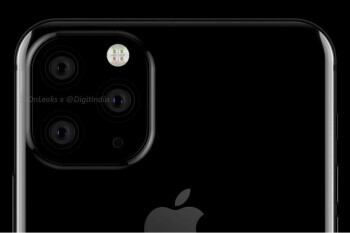 According to one of the most prolific and reliable leakers in the mobile world, there are two main possibilities for Apple’s first triple rear camera implementation. The Japanese Macotakara blog, which has correctly predicted this type of stuff before, expects the iPhone XI (or 11) to ultimately adopt a square-shaped bump inspired by the Huawei Mate 20 duo. We’re talking about the first of two rendered designs purportedly being considered by Apple in the EVT (Engineering Validation Test) stage of the new handset’s development. Yup, the one almost unanimously despised by our readers, based on a poll conducted a couple of months ago. Macotakara seems to believe this might end up looking identical to the large and symmetrical camera arrangement on the back of the Huawei Mate 20 Pro, with three imaging sensors and the flash positioned in each of the four corners. That would arguably be an improvement over the monstrosity depicted back in January, which was all over the place, also including a microphone, making pretty much no sense from a Feng shui standpoint. Still, the consensus among “iFans” voicing their preferences all around the interwebs was that the cyclops-style horizontal setup looked better. Meanwhile, we remain open to all possibilities, including a good old fashioned vertical layout. Three cameras on the smaller iPhone XS sequel? If Apple is indeed preparing three new iPhones, logic dictates that any difference in the number of cameras mounted on each model will line up with a screen size gap. But Macotakara’s “Chinese supplier” sources claim Apple has a whole other plan. Namely, there’s a chance both the iPhone 11 (or XI) and 11 Plus (or Max) will come with three rear-facing snappers… in certain storage configurations. In other words, entry-level variants of XS and XS Max sequels could share dual lens setups, with an additional camera offered by top-tier configurations. That would definitely be an unusual approach, likely aimed at providing cutting-edge specifications for fans of smaller devices as well. So, no, bigger might not automatically mean better for the 2019 iPhone lineup. Unless we’re talking about storage sizes rather than screen diagonals. It’s unclear exactly what that strategy could mean for an iPhone XR follow-up, but we’re guessing any such “inexpensive” flagship would stick to dual imaging sensors (at best). Unfortunately, the latest rumor doesn’t tackle the actual camera specs of the iPhone XI family, so we’re left expecting a combination of 10 and 14MP lenses, with the third rear sensor cloaked in secrecy, although there’s a good chance we’re looking at a 3D ToF (Time-of-Flight) affair supporting super-advanced augmented reality tricks.